New "Star Wars" U.K. stamps celebrate the upcoming release of the franchise's latest movie. Only a few short months before the next "Star Wars" film arrives, the United Kingdom announced eight stamps to mark December's release of "Star Wars: The Last Jedi." "Aliens [in 'Star Wars'] are nonhuman species who live alongside humans, speaking either human languages or languages of their own," representatives from Royal Mail, the U.K.'s postal service, said in a statement. "Many aliens have distinctive anatomies, from the tall, hair-covered Wookiees, such as Chewbacca, to the diminutively shaped, short-sighted Maz Kanata. "Droids are everywhere in the galaxy," the officials added. "First developed in the distant past, they assist humans and aliens in every way, from flying spaceships and providing power to spreading war and terror." Each stamp includes a featured character as well as a famous spaceship or vehicle from the series. Also, the "droid" stamps have fluorescent ink that shines under UV light. Maz Kanata: This 1,000-year-old alien, whose race wasn't named in "The Force Awakens," gives Jedi knight Luke Skywalker's lightsaber to Rey, a young woman who appears to be sensitive to the Force. The Force is an energy field created by all living things in the universe. Jedi knights can use the Force in battle, and for other purposes. Chewbacca: Known as "Chewie" to his friends (including smuggler Han Solo), this Wookiee alien is known for his shaggy appearance, short temper and outstanding loyalty in the original trilogy of "Star Wars" (1977-1983). In "The Next Jedi," Chewbacca must adapt to a new ship companion, Rey, after the death of Solo. Supreme Leader Snoke: This alien (whose race is also unknown) was featured in "The Force Awakens" as Jedi killer Kylo Ren's trainer in using the dark side of the Force. Snoke, the leader of the evil First Order, previously ordered Ren to find Skywalker, and was also the behind the creation of the "Starkiller" (a huge planet-size weapon intended to destroy the New Republic government). Porg: These are small, flightless birds featured on the planet Ahch-To, where Skywalker now lives in exile. Ahch-To is also where the first Jedi Temple was located. "The Next Jedi" will feature these birds. BB-8: One of the heroes of "The Force Awakens," this orange-and-white droid was loyal to resistance fighter Poe Dameron. The last movie saw the droid forging new alliances when he got separated from Poe and met up with Rey and Finn, a renegade Stormtrooper from the First Order. R2-D2: This droid made a brief appearance in "The Force Awakens" after featuring heavily in the original "Star Wars" films (1977-1983) and prequels (1999-2005). He fought alongside Jedi knight Anakin Skywalker (who later became the evil Darth Vader), and also with Anakin's son, Luke. In "The Force Awakens," audiences learned that R2 has a map that shows where Skywalker is hiding. C-3PO: Anakin Skywalker built this droid to help his mother on his home planet, Tatooine. C-3PO was later a skilled diplomat in the original "Star Wars" films, although he was always very nervous in a battle. K-2SO: This droid debuted in 2016's "Rebel One," where he helped Capt. Cassian Andor's resistance movement in its battle against the Empire. The droid sacrificed himself so that his allies could steal the plans to the Death Star, a moon-size weapon that can blow up planets. 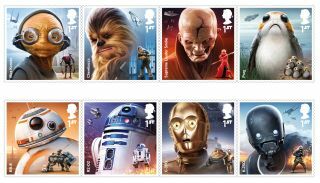 Fans can preorder the stamps at www.royalmail.com/starwars.